When tea friends get together, ideas start flowing. We sip and talk about anything and everything, and of course conversation always comes back to tea. After one of our tea meet-ups, Georgia, Jee, and I decided to work on a special collaboration together. We wanted to combine our passion for tea and our love of food. Last year the three of us decided to formalize our tea education by taking an online tea sommelier certification program. We are over a year into our studies at ITEI and have learned so much, yet there is never an end to one's tea education. We are perpetual students of the leaf. In our online classes we often do tastings with a formal evaluation sheet. After formally tasting and assessing the tea, we talk about what sweet or savory foods would pair with it (or perhaps if the tea needs to be consumed alone). The three of us decided to take our tea tasting and pairing skills and put them to good use. The Tea Pairing 101 series has been born! 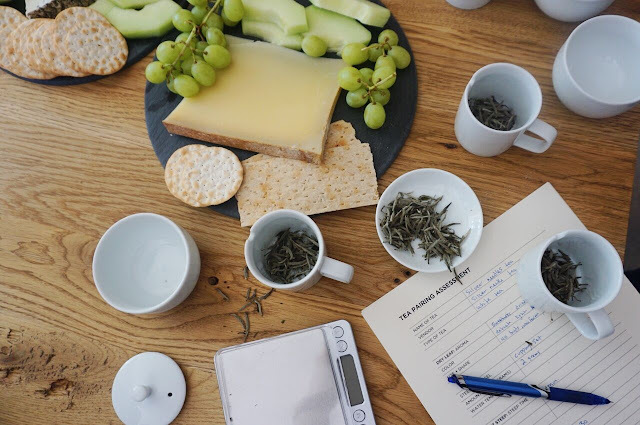 Today is the result of our first installment, pairing white tea with cheese. 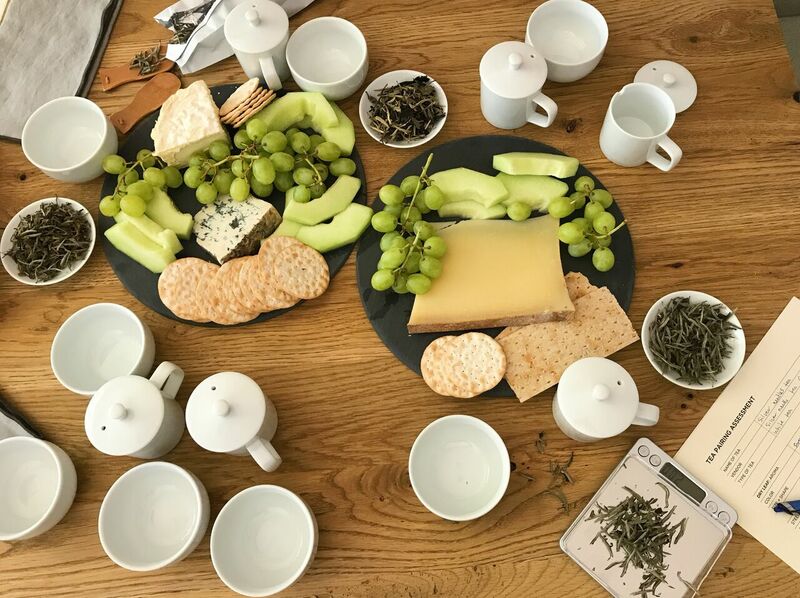 Pairing tea and cheese isn't a novel idea, but eating cheese while sipping on warm tea is such a luxurious pleasure. Much of the advice I've seen is to look for pairings that harmonize and enhance flavors, or use contrasting flavors that play well together. It's tricky to give pairing advice because taste is subjective. My palate is quite different from yours (No cilantro, ever!). But there are few guidelines to stick with, such as pairing more delicate flavors with subtle and soft teas, and allowing for more dynamic flavors with robust teas that can stand up to the pairing. But there is a huge grey area that can be tinkered with. The three of us actually had differing choices for one of the tea and cheese pairings, which shows how your personal preference plays an important role. The Tea Pairing 101 series consists of one type of tea, three versions of that tea, and three snacks- sweet or savory- to match. We want these pairings to be useful; things you could serve to a gathering of friends or enjoy for a quiet tea time. 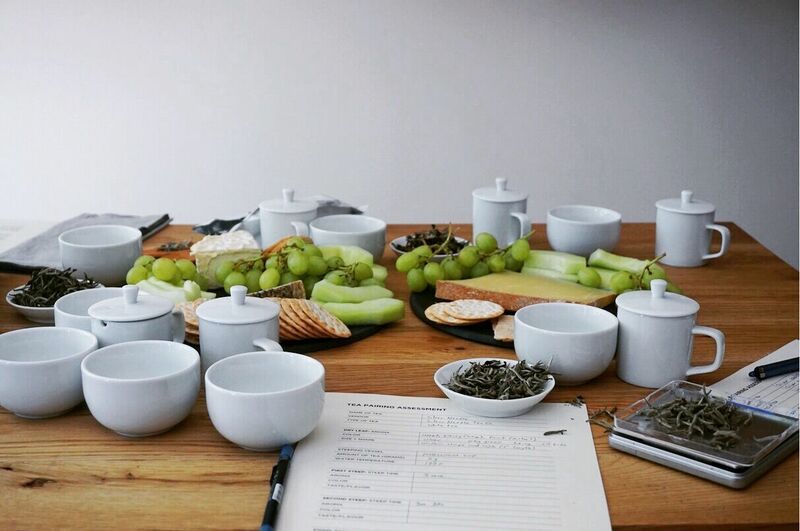 Each tea is tasted and assessed with a series of variables on a tea assessment form. We adapted this form from one we use during our classes at ITEI. 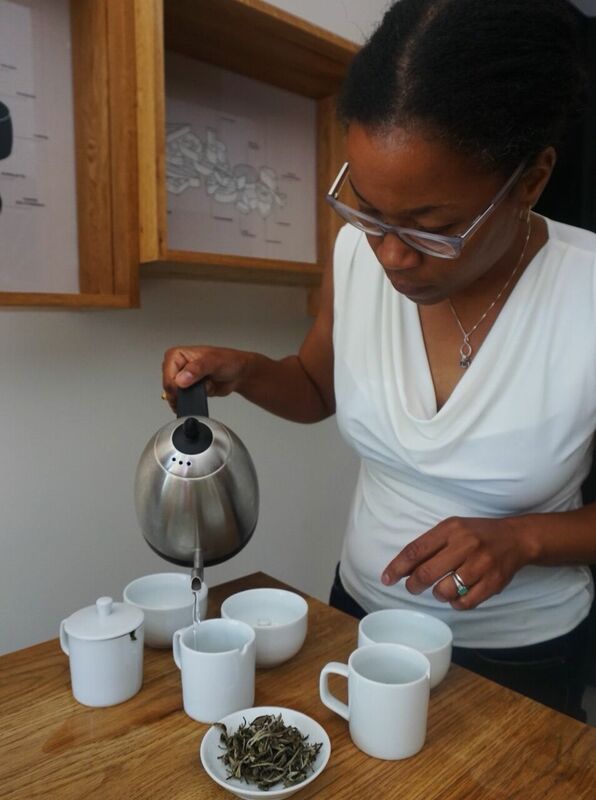 Teas are prepared in a professional cupping set. 2 grams steeped at 3 minutes is the professional standard. 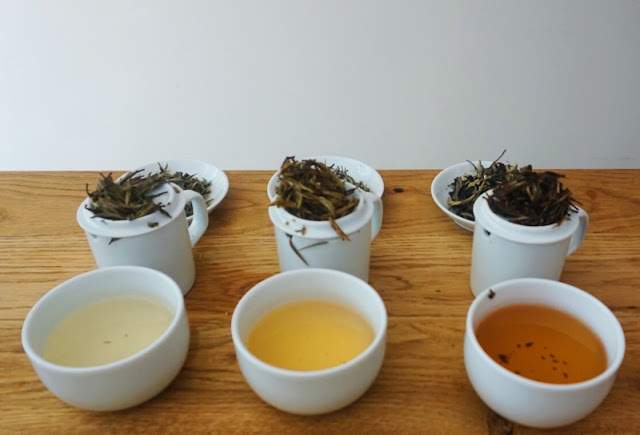 We actually tried the teas at 2 grams but found the flavors were more pronounced at 3 grams, so our palates won over official standards for the white teas. The water temperature used was based on the type of tea. We prepared 3 cups each, so we could each sip and then taste the cheeses to determine which was the best match. Our venue for this pairing event was The French Cheese Board in SoHo, the perfect place to learn all about French Cheeses. The shop generously donated three cheeses and gave us full use of the store to set up our pairings and take pictures. Needless to say, the staff was incredibly patient. Furniture may have been moved around to accommodate our photos. First, a Silver Needle (baihao yinzhen) from Silver Needle Tea Company. The dry leaves consisted of all fuzzy silver buds. The dry leaf aroma was very sweet, with notes of dried grass and honeydew melon. The melon and hay flavors translated to the brewed tea. Sweet, light, and refreshing. This tea looks quite delicate but it has a nice fruitiness that will work well with cheese. Second, Nepal White from Royal Tea New York. The dry leaf gave off an aroma of dried grass and muscatel grapes. We all let out an audible gasp when we smelled the delicious aroma. The steeped tea was extremely fruity with the muscatel grape flavor taking center stage. The tea was sweet and a bit more dry than the others, with a nice little tannic bite. Because of this, it could work with a slightly stronger and more complex cheese. Third is Midnight White from In Pursuit of Tea. The dried leaves reminded me of freshly mowed, brittle summer grass. Not exactly hay, but not fresh and green, either. I'm brought back to childhood, looking out an open window and watching my dad mow the faded summer lawn. The leaves are a beautiful mix of camouflage green along with fuzzy silver buds. Some of the leaves even have fuzzy on the underside. The tea smelled of honey and earth, a very interesting mix. The brew was strong on honey, slightly earthy with a bit of dried fruit. All three teas were provided by the companies mentioned. Beaufort, a firm unpasteurized cow's milk cheese from Savoie, in the French Alps. This cheese has nutty and buttery notes. It is also a little bit grassy and herbaceous. So it's not super strong, but it does have depth and complexity. Also, the texture works really well with tea, since the warm tea starts to soften the cheese on your palate and bring out the flavors. Brillat Savarin- This soft, ripe cow's milk cheese is from Ile De France. A cheese that I just have to describe as 'lucious'. It's so creamy and rich, with a slight tang that makes it quite interesting. It has a lingering aroma of mushrooms on the palate. I could seriously eat this cheese every day. Blue De Chèvre- exactly as named, a goat's blue cheese. This cheese is from Rambouillet and has the earth and tang of goat cheese along with the moldy aroma of blue cheese. Salty, tangy, and a bit of that barnyard funk. Would this work at all with our delicate white teas? Maybe not, but we decided it would be worth the try to find out. Why not have a dark horse in the race? For the delicate and fruity Silver Needle, the beaufort worked best. The buttery flavor of the cheese brought out the softness of this tea, and the nuttiness played nicely with the melon and dried grass notes. Even though this is a hard cheese, it's not overpowering. It has a little sharpness but it's mostly buttery and nutty. It not only brought out the softness of the tea, but it brought out a bit of floral aroma as well. For the Nepal White, things got a bit wacky. This was my favorite tea, I loved the juicy muscatel grape flavor. Since this tea had a bit of astringency and a stronger flavor, I thought it might be a contender for the Blue De Chèvre. It sounds totally bonkers but it actually worked. Kinda. I think it's important to get a bit creative with pairings, and not keep to strict rules. A white tea with blue cheese? I never would have suggested it, but after tasting it, it's an interesting choice. Perhaps the Beaufort would be a better harmonious pairing (especially with the strong fruit flavor in the tea), but I'm sticking with the blue! Finally, the Midnight White. The dry grass flavor made me reach for the mushroom finish of the Brillat-Savarin. To be honest, I'd eat this delicious cheese with any beverage, but I do think it paired nicely with the Midnight White. The honey notes in the tea evened out the slight tang in the cheese. Everything was just a smooth, luscious jumble of goodness. I already said I could eat this cheese every day, right? I think my favorite overall pairing was the Nepal White and Beaufort, with the Midnight White and Brillat-Savarin as a close second. As I mentioned earlier, we had one differing preference between the three of us. You can probably guess which cheese was swapped, but you'll have to check out Jee and Georgia's posts to see what they selected! The Outcome- Consider The Cheese Plate! Pairing white teas isn't as easy at it seems. 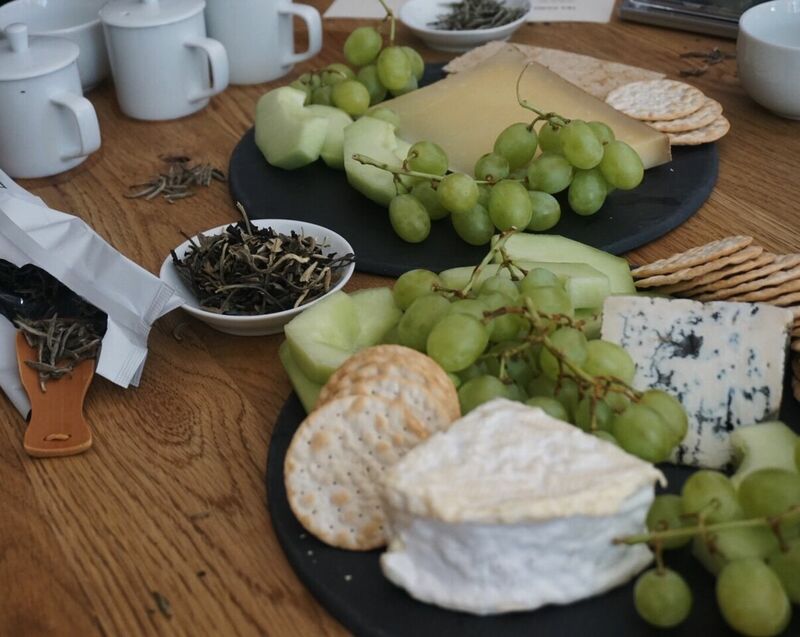 White teas have subtle nuances, and just choosing a mellow cheese isn't going to impress your palate. While strong cheeses such as the blue de chèvre may have been a bit overpowering, it actually did fairly well standing up to the Nepalese white, so don't rule it anything until you've given it a taste. 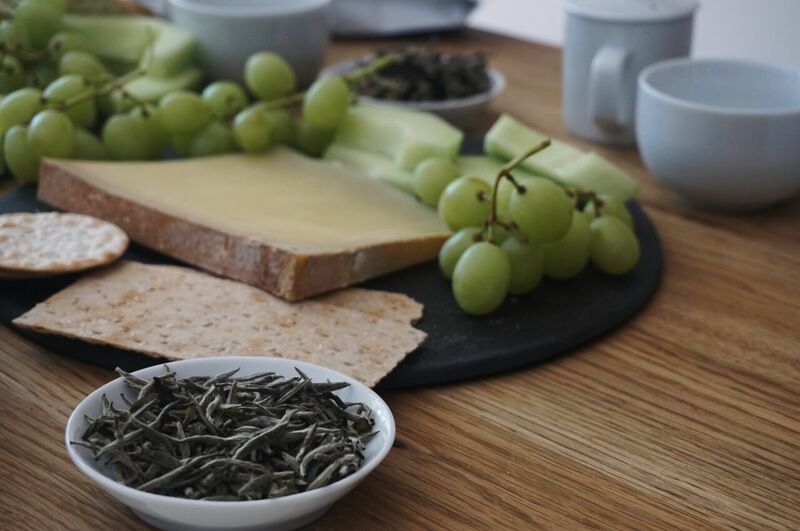 The grassy notes in the cheese also worked with the grass and fruit notes in the tea. I like to think about a composed cheese plate when trying to pair these teas- on a composed plate you usually have fruity flavors such as grapes and jam, possibly a sweet honey, and sometimes a few vegetables. That's exactly the way to think about these teas- the white teas all had cheese plate flavors- fruit, honey, a bit of something green. A good cheese plate also has a play on textures. It was good to have cheeses from different milks and textures to play off the tea. If we did this pairing again, I'd like to try a sheep's milk cheese, as well as something with even more age to it and see how it does. As I mentioned, taste is subjective, and our suggestions are merely that- things we suggest would work well. But if you don't agree, that's great! 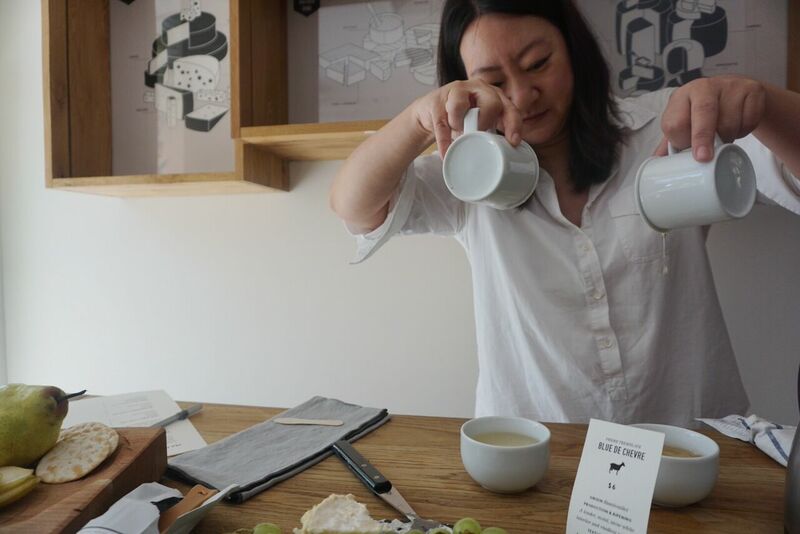 Take the time to taste a few teas and cheeses, and decide what you like better. The best part about pairing tea and food is the creativity. Get tasting and figure out what works best for you. Find out how my other two friends felt about our tea and cheese afternoon. Visit Georgia's blog Notes On Tea, and Jee's blog Oh How Civilized. Thank you so much to The French Cheese Board for letting us invade your shop, style photos, sip tea, and of course eat cheese! Thank you to Silver Needle Tea Company, Royal Tea New York, and In Pursuit of Tea for providing the white teas. If you are interested in learning more about our studies at ITEI, please drop me a line. I even have a code to share for a discount on classes. Stay tuned for our next Tea Pairing 101! It will feature green teas and...the snack? You'll have to stick around to find out. Brilliant! This Tea & Cheese pairing conducted by the 3 of you is a real first class treat. 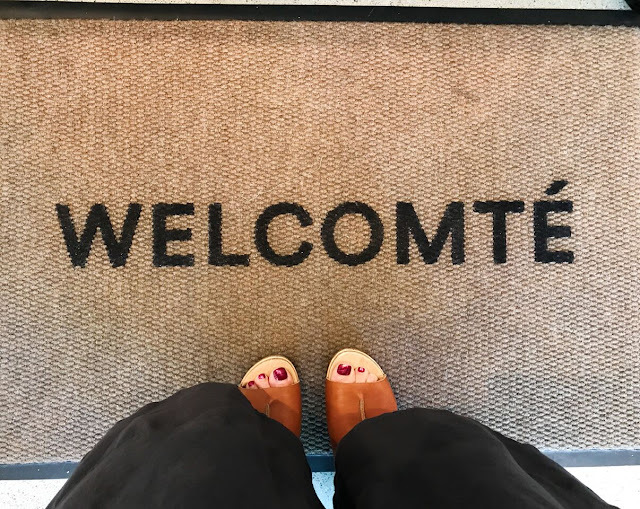 The generosity of your words and verbs simply transport us in that room at the French Cheese Board. Wonderful invitation to creativity in this chapter so one could either choose complementarity between the tea and the selected cheese or go the opposite way. Well Done! Thank you for the kind words Sylvana! We had such a wonderful time. 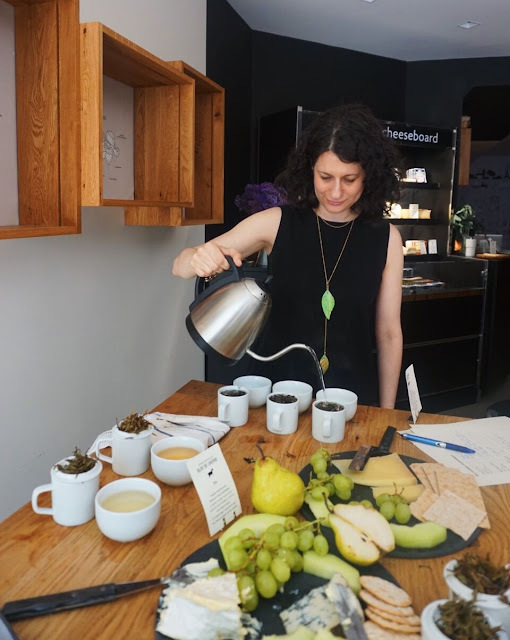 Hello Sara -- finally posted a discussion of the chemistry of your white tea and cheese pairing on my blog. You can find the link to it on facebook.com/pairteas. So happy to follow your blog, not just the tea pairing parts—it's all really good! Thanks Virginia! Can't wait to have a look at your post. Hope all is well!